I came across PMG when I tried to go to one of my favorite cafés to work at on a visit back home to Boulder. It wasn't open yet -— the windows were covered in newspaper and there was movement inside the building, so it was clearly on its way to opening up something new. I'm gone from home so often that I'm used to seeing my favorite places disappear by now. But it's rare for one of those to be replaced by something I enjoy even more, which is what happened this time. Once PMG opened, I decided to head there for a nice last dinner with my parents before heading out to my travels around the world. It was September and the place had been open for four days, but it was packed (for such an intimate atmosphere) with a surprisingly large number people we knew. We ran into several groups of friends and acquaintances, schmoozing over the menu and the fabulous wine list, which is exactly what owner Emily Gold was hoping for in opening the place. Emily grew up in Boulder. We're actually the same age and attended high school at the same time, but didn't know one another. 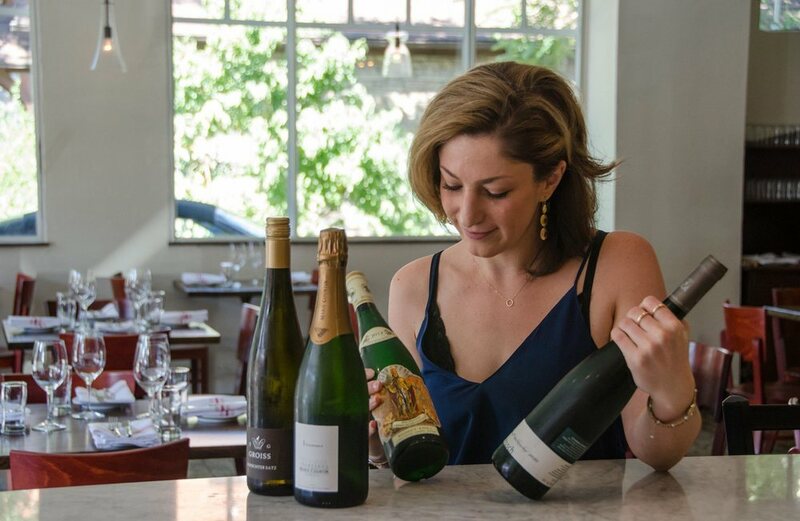 After college, she followed a lifetime love of wine through various jobs to get to know the industry before getting the opportunity to open her dream restaurant in her hometown. It's cozy and has got a community vibe, taking great wine off of its pedestal and making it accessible and affordable for anyone who is interested. When we met at the restaurant that night I asked her if I could come back, and she agreed to tell me more about her journey to opening PMG. How did you get started in wine, get interested in that industry? The way I got into wine, and the thing that makes it different, is actually more of my dad’s story than mine. He got hired to be a professor at CU in 1969, but they weren’t ready for him yet and sent him to do a sabbatical in Geneva. He met all of these people there and felt like he was this hick from upstate New York. These people were so cultured and knew about wine, so they started teaching him about wine and drinking it together. He came back to the states and started buying wine, and because it was in the 70s and 80s there were these incredible, iconic bottles for really affordable prices. And he ended up with a cellar, that once I was born was fully stocked and aged appropriately, So I grew up drinking these amazing old Bordeaux and Alsatian Whites, mostly — it's what my dad loves. Finally when I was almost finishing college, I thought “I don’t really know what I’m going to do. You know, I do love wine.” So I started studying through the Court of Master Sommaliers and then fell into this job with Kermit Lynch, and now here I am! What was it like working for Kermit Lynch? I was living in France, I was in Burgundy, so I drank beautiful wines. Great, great, great wines and this incredible experience, a whole different kind of culture than just being in Paris. That part was incredible. It was an office job, but I got to travel a little bit here and there but it was on weekends when I could afford to at that time. Was it a French-speaking job? a new country, having a new job, moving in general, and switching back and forth between three different languages all the time. My brain really hurt. What took you from that to opening PMG? It is, and not only do opportunities pop up like that, but then you realize that everyone you’ve ever known wants to support you, with maybe a few exceptions. Yeah, but let the haters hate. Exactly! The best part of all of this is getting to see my friends and family all of the time and feeling like the community here really is what I fantasized it was while I was gone. I KNOW IT INVOLVES A MILLION THINGS BUT CAN YOU GIVE ME AN OVERVIEW OF WHAT YOU HAVE TO DO TO OPEN A RESTAURANT? license, and getting our state and city sales tax set up. Yeah — all of that stuff, which feels like it’s a never-ending list. And then there’s all of the design, which I was totally caught off-guard by. I am terrible at design, about making things cozy and lived in. 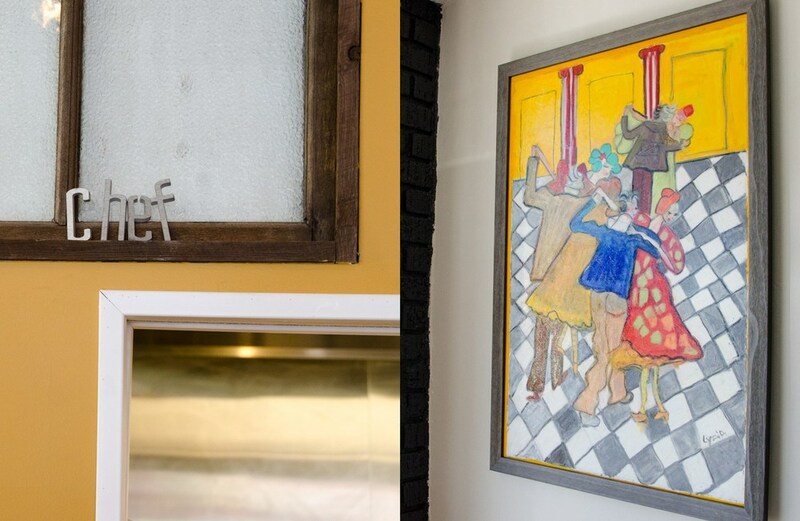 And we had no budget at all, so Sal (chef Salvatore Proia, pictured in the gallery above) and Burton (Burton Daniel, general manager), and I literally painted this entire place. We spent three 14-hour days in here. It was fun! It was really dirty and we had pizza and drank a bunch of beer, and painted. AND THE ARTWORK IS DONE BY YOUR SISTER? Yeah, my sister. One of her jobs is an artist. And we had been saving corks my whole life, so when we were getting ready to do this, I asked if she would make me a piece with them. And that’s all I asked. I like it too because I get to look at all of the corks and remember things. All of the little pieces that we had to think about. So speaking of a wine list, what are your favorite wines right now? One of the biggest surprises that I had over the course of my couple of years in France was that I love Chenin Blanc, I'm obsessed with it. I want to drink all the time, and it doesn’t matter what the weather is doing and it doesn’t matter what meal I’m having, that’s what I want. If I see a really great bottle on a list for an affordable price, I’m like “I’ll have that with my steak” it doesn’t matter. So we have a couple of really great bottles of Chenin. And then one wine I haven’t put on the list yet because I don’t want to sell it to anyone is this Anjou Blanc, it’s the perfect balance of acidity and sugar, that it feels really good to have in your mouth. You know, drinking a wine is it’s own experience. It’s exciting, it’s an exhilarating wine to drink. I don’t know, they’re all so good! I love all of our wines. It’s really hard for me to choose. You’ve achieved a large part of opening, the big stuff. what do you see coming up? You know, it’s hard to say — right now I’m still trying to figure out what my job is now that we have all of these wonderful people doing things for us, I don’t know what to do with myself. We were hoping to get really great great great people here because of the wine and having that be a perk. Thinking we want to do educational things, do tastings, to support each of the people working with us in learning about wine. Which we’ve done a little bit of, but honestly we did more of it before we opened. We had all of the four distributors that we work with, we had them each come in at least once and do a lecture and tasting on different regions, it was so fun! And now that we’re open, now we’re starting to get more into a rhythm where I think we’ll have the band with to start working on some of those things again. industry, specifically for the people trained through the Court of Master Sommaliers, and can’t find enough blind tasting groups to be a part of. So I really want to develop that side of this business that I had dreamed about and now have not had even a second of time. And last — I don’t know how we haven’t gotten to this yet, but can you talk about what PMG stands for? PMG stands for pour ma geule, a French expression. Geule is a slang word for mouth, usually used for animal muzzles, but we translate it as 'trap.' So, 'for my trap.' It’s the expression winemakers use for their stash for friends and family. I like it for this concept as it doesn’t have any association with quality.